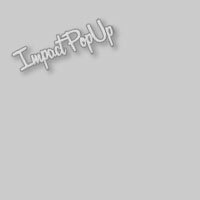 Impact PopUp - Grab Your Visitors By The Eyeballs! We'll show you exactly how to do it in just a few simple steps - even if you don't know a single line of HTML code! Special Bonus: Order through this page and you'll be upgraded to Master Resell Rights ... For Free! In today's fast-paced world, you have to make an impact fast! You only have a few seconds to grab your visitors attention, or you risk losing them forever. What if I could show you a way to capture your visitors attention, force them to read your most important message, and do it with just a few simple clicks? Would that interest you? It's no secret that popups are effective, but traditional popups only work if your visitor doesn't have a popup blocker installed. Most popup blocker technology works the same way. Almost all popup blockers look for any code that creates a new window, and then closes that window before it even has a chance to open. This seemingly harmless technology is blocking more than just a popup, it's killing your profits! "Impact PopUp" Uses Specialized Technology That Is Smart Enough To Get Around Those Pesky Popup Blockers! What you need to create effective popups is a something new. Something that is just as effective as a traditional popup, but smart enough to not fall prey to popup blocking technology. That is exactly what "Impact PopUp" does! You see, this new method of creating dazzling popups doesn't create a new window of any kind. In fact, it's actually part of your web page itself! Using "Impact PopUps" you can rest assured that your message will show up when you want it and create the impression you so desperately desire. Impact PopUps bypasses the popup blockers and will give you the peace of mind in knowing that your messages will be seen. What Can I Use "Impact PopUp" For? Your Product's Most Important Feature - Highlight it in a popup and it will really make an impact! Special Discounts Or Promotions - Everyone loves a sale, but only if they know about it. An Important Testimonial - Build credibility from the minute a customer hits your website! Contest & Sweepstakes Announcements - Who doesn't want to be a winner? Product Updates - Displaying an "updated last week" message will skyrocket your sales. Reminders - Let your prospects know that a new product is coming, or that a sale is ending so they'd better act fast! Opt-in List Building - Tell your visitors about a free gift and your list will grow by leaps and bounds. Traffic Control - Have an old domain that's still getting traffic? Make sure your visitors know where to go! Up Selling & Cross Selling - Include an Impact PopUp on your thank you page and grab your buyers while their credit card is still on the table! Affiliate Product Promotion - Let your prospects know about new product launches the minute they get to your site. Are you starting to see the doors that will open to you when you start using "Impact PopUp"? No longer will the door be slammed in your face, it will be flung wide open showing your visitors your most important message within seconds. 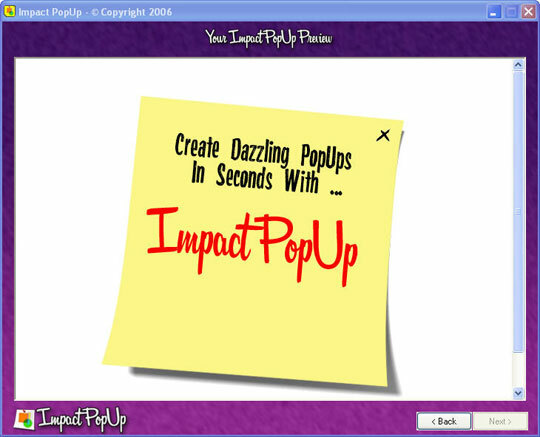 "Impact PopUp" Is Point-And-Click Easy. If You Can Click, Copy, and Paste, You Can Do This! 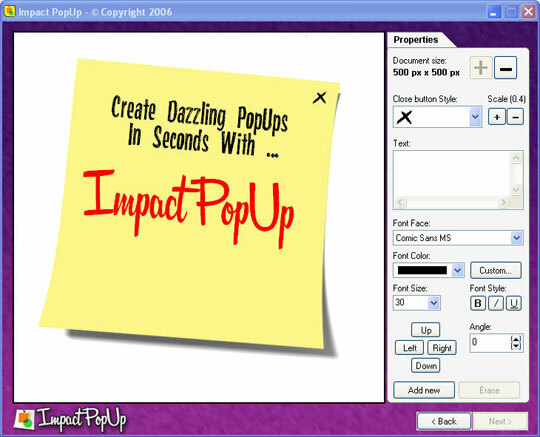 "Impact PopUp" is a simple Windows™ application that will guide you through the entire process of creating these dazzling, attention grabbing, popups. Simply point, click, and create ... It really is that easy! Choose from one of the 10 professionally designed, high-impact graphics for your "Impact" popup. Simply highlight the popup template you'd like to use, and move on to step two. As you can see, "Impact PopUp" includes the most popular graphic styles, styles that have been proven to get your visitors attention. These amazing graphics allow your popup to appear as though it's almost magically floating above your website! Step two is where the magic happens. 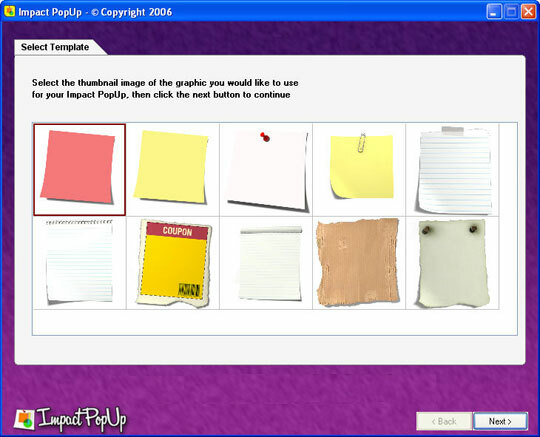 "Impact PopUp" gives you full creative control over the look and layout of your popup. In this step you can resize the graphic template to fit your website, choose whether or not to include a close button on your template, and add the text to the template. "Impact PopUp" allows you to use any font you wish! If the font is installed on your computer, you can use it in your popup. You can also choose the color, position, and even the angle of all your text! Everything is done with just a few clicks of the mouse. Drag and drop you text, resize the image with one click, and change font colors and styles with ease. After you've created the look for your popup, it's time to tell it how to act. Again, you have full control over your "Impact" popup, and it's all configured with a few clicks of the mouse. Set the website where you'd like your visitors to go when they click your "Impact" popup, or you can have the popup close when it's clicked. You can set the popup to open links to the same window, to a new window, or even have the popup close automatically after a few seconds. You can also set the exact position where you'd like your "Impact" popup to appear on your website. If your logo is on the left, just set the popup to appear to the right ... it's that easy. And as an option, you can set a cookie on your visitors computer so that your "Impact" popup doesn't show up again if they come back to your page. Once you've created your "Impact" popup you'll get to see exactly how it will look and act on your website. This preview step allows you to eliminate any mistakes, and do it before your visitors ever see them. This step takes all the guesswork out of the equation. If you're not happy with your "Impact" popup, just click the back button and make your changes. If you've set your "Impact" popup to close after 7 seconds, you'll see that happen here. This is a true and accurate preview of how your popup will look on your website. The last step in the process is to add the "Impact" popup code into an existing web page, and we've made this a snap too. Simply browse your hard drive for the web page you'd like to add your "Impact" popup to and click the "Add popup" button. Once you click that button, everything will be done for you, and in just a few seconds you're ready to go. Or, if you'd prefer, you can save the graphics to hard drive and the program will give you the code to insert anywhere in the body of your web page. Of course we like to keep things simple, but if you want to make the changes yourself, that's completely up to you. Once you're done, simply upload everything to your website and be ready to see your conversion rates go through the roof! As you can see, this really is a point and click solution that allows you to make a dramatic impact in seconds. "Impact PopUp" Crushes The Competition And Stands Head-And-Shoulders Above The Rest! 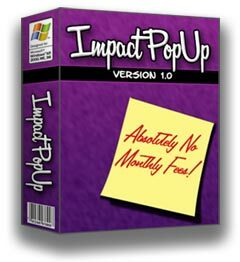 Let's face it, in the software game, there are always competitors out there, but "Impact PopUp" is the obvious choice. You just won't find another application that is as easy to use, and as feature packed as this outstanding application. The software runs on your computer, and the popup files are stored on your web server. Using this program gives you the peace of mind in knowing that you'll never have to worry whether your service provider is going to be around tomorrow. All of the files required to make your "Impact" popup work are stored on your own web server, so you're not at the mercy of another host. If your web site is online, your popup will be online too. And best of all, "Impact PopUp" is the best value on the market. Unlike some of our competitors, you'll never have to pay a monthly fee. Once you purchase "Impact PopUp", it's yours forever, without ever having to spend another penny. Your satisfaction is important, and I guarantee it when you order Impact PopUp and I back it with a no risk, no questions asked, 100% money back guarantee. If for any reason, you aren't completely satisfied with my product, just contact me within 60 days and I'll refund 100% of your purchase price. No need for explanations or excuses, just let me know and I'll refund your full purchase price on the spot. Here's How You Can Start Using "Impact PopUp" Immediately, And Watch Your Profits Shoot Through The Roof! At this point you're probably thinking that, "Software that is going to give me such a huge advantage over my competition must be out of my budget." After all, many of our competitors make you pay a monthly fee, pay for additional popups, and even pay for bandwidth. Not here! What if I told you that you could download, and instantly put the power of these eye-grabbing popups to use for less that $100? Would that be fair? Well, we're going to do even better than that! You're not going to pay $100, you're not going to pay $90, or even $80 ... If you order right now, you can download your copy of "Impact Popup" for only $37! For the low price of only $37.00 you�ll receive this powerful, feature-packed software that allows you to virtually reach through your visitors monitors and grab their attention! You'll be creating eye-catching, profit producing popups for your web site in just minutes. You'd normally expect software with such a robust set of features to cost you three or four times as much, and that doesn't even take into account the monthly fees. But, with "Impact PopUp" there are no hidden fees, no monthly fees, and nothing else you ever have to buy. For the one-time low price of only $37 you in complete control of creating your own high-impact, unblockable popups. It's time for you to fight back. Stop putting up with traditional popups that are only being seen by a fraction of your visitors and start using "Impact" popups that will get your message through. Order "Impact PopUp" right now at the incredibly low price of only $37 and you'll be making an impact where it matters the most ... your bottom line! P.S. Remember, there is absolutely no risk when your purchase "Impact PopUp" right now at this very low price. We can't guarantee this low price will be here tomorrow, and since every purchase is backed by our 100% money back guarantee, the time to take action is now. P.P.S. Every time a traditional popup is blocked, it's like someone slamming the door on your sale. These are your visitors, make sure they're getting the message that you want them to see!